This sanctuary decided it wasn’t enough to just rescue victims of human-wildlife conflict, but that it was time to end the conflict. Ngamba Island is like any other tropical island, save for one surprising difference: it provides a safe heaven for almost 50 rescued chimpanzees. This island in Lake Victoria, the largest lake in Africa, was chosen in 1998 as the home for the Ngamba Island Chimpanzee Sanctuary. The location allows for an innovative approach to chimpanzee rehabilitation and care thanks to its vast size, natural forest, and seclusion which helps to regulate human influence. Chimps can forage and build nests as they would in the wild in this 95-acre forest, but they still receive additional diet supplements, veterinary care, and protection offered by the Sanctuary. 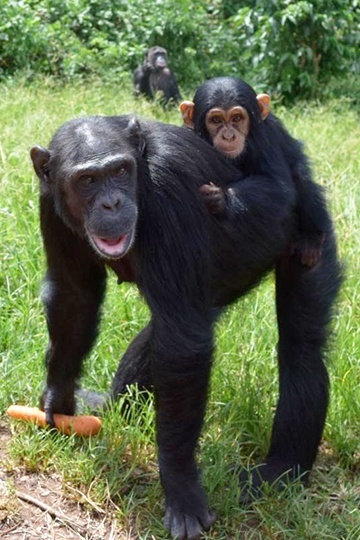 In their time rescuing and caring for orphaned chimps, staff at Ngamba Island Chimpanzee Sanctuary expanded their mission to incorporate programs aimed at keeping chimps safe in the wild. Their education program is called Change my Community and aims to empower locals to act within their own communities. Through school and community outreach, schoolchildren in Western Uganda receive guest lectures on chimpanzee behavior, conservation, health and sanitization, and even drama. This curriculum aims to increase awareness of how human actions influence the natural world, and they have been very successful in keeping children’s attention through interactive lesson plans. School groups also have the opportunity to visit Ngamba Island for tours and onsite classes in science. Youth education done at Ngamba Island works to improve the lives of children and lower human-wildlife conflict. Other projects accomplishing this goal are the community development training programs focused on providing alternative sources of income for communities near forests. They have had tremendous success with these programs, reaching over 2,600 local people and benefiting over 22,000 of their beneficiaries. Training in beekeeping, vegetable growing, and tree nurseries of native fruit trees not only provide economic improvement for communities, but they improve their sustainability and provide alternatives to poaching. Ngamba Island is also proud to have many research projects within the surrounding area. One important project is monitoring chimp distribution and movement on private lands, allowing for more effective conservation strategies. Other projects use surveys to determine the impact of conservation and government programs on people’s livelihoods. These research projects have been successful because they involve community members in the process, providing a chance for voices to be heard and awareness increased. Ngamba Island Chimpanzee Sanctuary manages to not only save the lives of orphaned chimps, but also improve the lives of local families. PASA is very proud to be involved in projects like these, and we encourage you to become involved by supporting Ngamba Island Chimpanzee Sanctuary. If Ngamba Island sounds like the perfect place to lose yourself in adventure while helping to care for rescued chimps, take a look into volunteeringwith them! 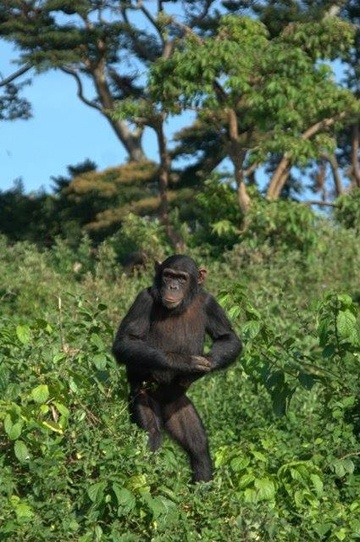 Chimps are able to bond with others and join families at Ngamba Island. Orphaned chimpanzees live in spacious, forest enclosures where they can exhibit natural behaviors.